These are a few of my favorite Scriptures. I cannot live my life without God and his word. 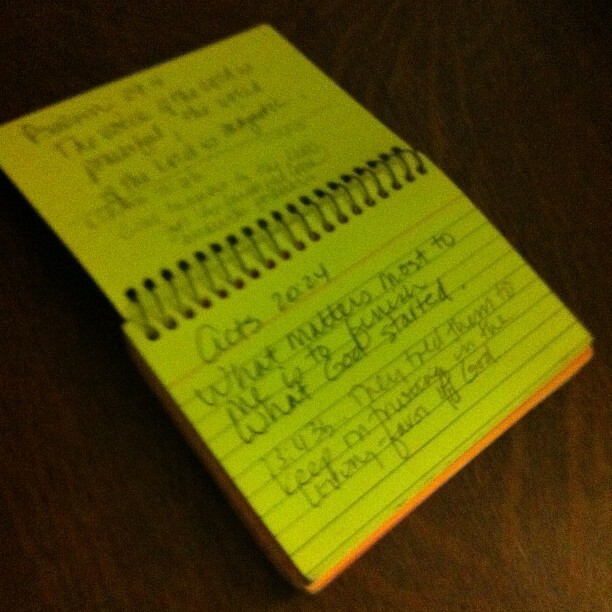 I keep a 3x5 wire bound note diary of verses that pop off the pages of my Bibles. This helps me in case I need to comfort someone with a specific verse. Start your own collection! Psalm 119:76 Comfort me with your love, as you promised me, your servant. Job 4:4 Your words have comforted those who fell, and you have strengthened those who could not stand. Psalm 18:1 I love you, LORD. You give me strength. Psalm 118:14 The Lord gives me strength and a song. He has saved me. Deuteronomy 33:27 The eternal God is your shelter, and his everlasting arms support you. 1 Corinthians 15:58 … don’t let anyone move you off the foundation of your faith. Psalm 31:24 Be strong, all who wait with hope for the LORD, and let your heart be courageous. Psalm 119:165 There is lasting peace for those who love your teachings. Nothing can make those people stumble. Psalm 4:1 My faithful God, answer me when I call out to you. Give me rest from my trouble. Show me your favor. Hear my prayer. Psalm 22:19 LORD, don’t be so far away. You give me strength. Come quickly to help me. Psalm 33:22 Let your unfailing love surround us, Lord, for our hope is in you alone. Psalm 38:18 I confess my guilt. My sin troubles me. Psalm 139:23 God, examine me and know my heart; test me and know my anxious thoughts. Psalm 38:21 Do not abandon me, O God. O my God, do not be so distant from me. 22 Come quickly to help me, O Lord, my savior. Psalm 27:7 Please listen when I pray! Have pity. Answer my prayer. 8 My heart tells me to pray. I am eager to see your face, 9 so don't hide from me. I am your servant, and you have helped me. Don't turn from me in anger. You alone keep me safe. Don't reject or desert me. Psalm 118:5 When I was really hurting, I prayed to the LORD. He answered my prayer, and took my worries away. Psalm 145:8 The Lord is kind and shows mercy. He does not become angry quickly but is full of love. Psalm 38:21 LORD, don’t desert me. My God, don’t be far away from me. Jeremiah 17:14 Heal me, O Lord, and I will be healed. Rescue me, and I will be rescued. You are the one I praise. Psalm 103:3 He forgives all my sins and heals all my diseases. Psalm 118:17 I will not die; instead, I will live to tell what the Lord has done. Psalm 37:5 Depend on the Lord; trust him, and he will take care of you. Isaiah 46:4 I will still be the same when you are old and gray, and I will take care of you. I created you. I will carry you and always keep you safe. Psalm 50:15 Call on me in times of trouble. I will rescue you, and you will honor me. Psalm 62:8 Trust God, my friends, and always tell him each one of your concerns. God is our place of safety. Psalm 91:14 Because you love me, I will rescue you. I will protect you because you know my name. Psalm 55:11 Turn your burdens over to the LORD, and he will take care of you. Psalm 56:11a I trust God. Psalm 37:7 Be still. Be patient. Wait for the LORD to act. Psalm 37:23 The Lord directs the steps of the godly. He delights in every detail of their lives. 24 Though they stumble, they will never fall, for the Lord holds them by the hand. Psalm 117:1 Praise the Lord. All you people, praise him because the Lord loves us very much, and his truth is everlasting. Praise the Lord! Hosea 14:8 “… I, the Lord, am the one who answers your prayers and watches over you. I am like a green pine tree; your blessings come from me." Philippians 2:5 Have the same attitude that Christ Jesus had. Psalm 116:15 (NLT) The Lord cares deeply when his loved ones die. Psalm 59:10a My God loves me, and he goes in front of me. 2 Thessalonians 2:13 My friends, the Lord loves you! Psalm 5:2 Pay attention to my cry for help, my king and my God, because I pray only to you. Psalm 9:9-10 God's a safe-house for the battered, a sanctuary during bad times. The moment you arrive, you relax; you're never sorry you knocked. Psalm 42:11 Why are you down in the dumps, dear soul? Why are you crying the blues? Fix my eyes on God-soon I'll be praising again. He puts a smile on my face. He's my God. Psalm 16:11 You have shown me the path to life, and you make me glad by being near to me. Sitting at your right side, I will always be joyful. Isaiah 45:7 I create the light and make the darkness. I send good times and bad times.